Toor Jan, 11 years old, and Andul Wodood, 12, had been walking behind their donkeys in Oruzgan Province when the helicopter fired on them, Afghan officials said. The two donkeys were also killed. General Dunford said that coalition forces thought they were firing on insurgent forces, and killed the boys by accident. More “collateral murder,” not mediated by a NATO apology. The response of the Afghan Peace Volunteers, reported by Voices for Creative Nonviolence, was to say “we are those 2 Children,” and to find donkeys, make signs, and take to the public square to protest the killings. 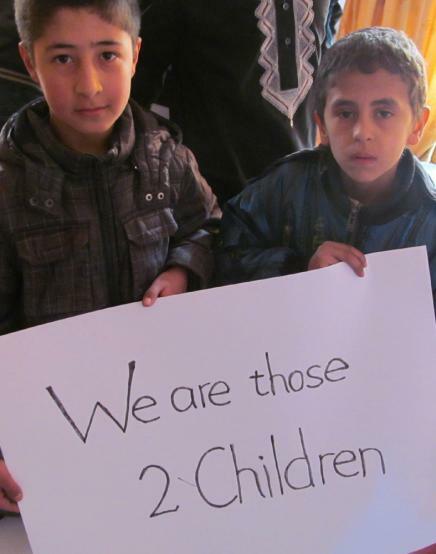 If children can make this protest under conditions of war and great deprivation, what does that challenge us to do? Afghans were in the streets protesting a raid on a house by Western military forces which killed civilians, including children. Afghan government investigators said that eight schoolchildren were killed, all but one of them from the same family. Locals said that some victims were handcuffed before being killed. Western military sources said that the dead were all part of an Afghan terrorist cell responsible for manufacturing improvised explosive devices (IEDs), which have claimed the lives of countless soldiers and civilians. “This was a joint operation that was conducted against an IED cell that Afghan and US officials had been developing information against for some time,” said a senior Nato insider. But he admitted that “the facts about what actually went down are in dispute”. The allegations of civilian casualties led to protests in Kabul and Jalalabad, with children as young as 10 chanting “Death to America” and demanding that foreign forces should leave Afghanistan at once. President Karzai sent a team of investigators to Narang district, in eastern Kunar province, after reports of a massacre first surfaced on Monday. 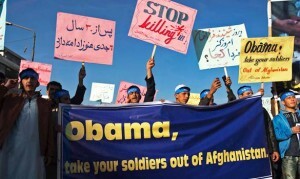 It is well known that the vast majority of people dying in the US occupations of Afghanistan and Iraq are civilians. Estimates are 1.2 million killed in Iraq, with more dying from sanctions under Bush One, Clinton, and Bush Two before the March 2003 invasion further destroyed the country. Why are we allowing this to continue in our names?